Hunters between the ages of 15 and 34 years old are the most likely to suffer serious injuries in tree stand-related incidents, according to researchers at the University of Alabama at Birmingham Center for Injury Sciences. In a study, presented online in the Journal of Trauma Injury, Infection and Critical Care, the researchers also reported that men were twice as likely as women to be injured in a hunting accident. They collected data from the 2000-2007 National Electronic Injury Surveillance System established by the Consumer Product Safety Commission and the United States Fish and Wildlife Service. The researchers reported that the number of Americans engaging in hunting has remained stable over the past decade, with 12.5 million hunters registered in 2006. That same data noted that there were 46,860 reported injuries related to tree stand use between 2000 and 2007. The most common injuries, the study reported, were fractures – most likely to occur in the hip or lower extremities. Injuries to the trunk, shoulder and upper extremities were less common. Head and spinal cord injuries were even less common, but still frequent enough to be considered significant. Hunters between the ages of 15 and 24 years old had injury rates of 55.7 per 100,000, and those aged 25 to 34 years old averaged 61 injuries per 100,000. Hunters over 65 years of age had injury rates of only 22.4 per 100,000. “The elevated injury rate among younger hunters is significant, because debilitating injuries in younger people are far more devastating than for older individuals because of the potential long-term effects that create both physical and financial hardships for patients and their families,” Gerald McGwin, Jr., MS, PhD, associate director for research at the University of Alabama at Birmingham Center for Injury Sciences and senior investigator for the study, stated in a press release. Younger hunters, McGwin stated, may have higher injury rates due to a willingness to take risks. Additionally, they may have less exposure to safety information and spend more time hunting than older hunters. 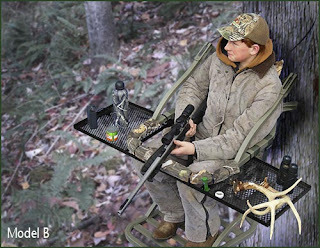 Safety campaigns that recommend the use of safety harnesses and the regular maintenance of tree stands could aid in preventing future injuries, he concluded.